I want to like MobileMe. It’s the Apple-sanctioned slice of cloud computing, integrated with the Mac and iOS operating systems. The setup is simple, the price is reasonable, and despite the unprofessional name and lack of phone support, when all is humming along things just work. Except MobileMe doesn’t keep working. It stops syncing. It loses data. And Apple provides little or no advance warning of potential problems, nor easy ways to fix issues that occur. Apple TV may have moved on to a professional product stage with the latest iteration, but from a business perspective MobileMe is still a “hobby” for Apple. Reliability, consistent behavior, and ability to get technical support when necessary are critically important requirements for business software. MobileMe fails on all counts. Nearly all events more than about six weeks old got deleted. Four years of business and personal appointments, vanished. A fix was possible, but not obvious. Calendars on the iPad break with this upgrade. They must be reconfigured manually until iOS 4.2 arrives. iPhone sync requires iOS 4.1 or more reconfiguration. Having suffered the same fate as others (all calendar events older than ±30 days lost in the upgrade to the new MobileMe calendar), I spoke to an Apple “FastLane” Tech. She was very helpful, but informed me that, basically, Apple is not supporting information going that far back, as it bogs down the servers. Really Apple – would it have been too much trouble to notify people that they would lose old calendar data when upgrading to the new format? Or clearly explain how to deal with the problem? Was it not possible to wait a few weeks before rolling out this change to ensure that calendars on iPads would convert automatically? This is not the way a reliable corporate service should behave. MobileMe data loss and service interruption headaches are not a new phenomenon. In 2008 with the introduction of the iPhone 3G, Apple renamed .Mac as MobileMe – a name nearly everybody dislikes – and added cloud-based sync capability with push notification services. Or they intended to offer this, but had tremendous problems with the MobileMe launch. Problems included losing people’s email, having to admit that they didn’t have true Push services ready, and multiple rounds of downtime. Apple wound up giving first 30, then 60 day service extensions to MobileMe subscribers as an apology. That was two years ago. Apple is now making a serious move into cloud computing with new product offerings and back-end servers, yet basic problems remain. For the past several months my clients and I have been experiencing intermittent account access failures. I typically help several people each month getting their data sync working again. Why is MobileMe in 2010 still a hit-or-miss proposition? On top of all this, Apple still does not offer telephone support for MobileMe. They offer online chat support instead, which is not a substitute for talking to a live representative when crises occur. 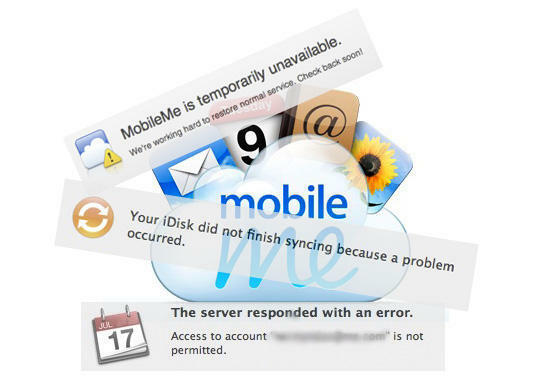 Why is Apple so afraid to talk to its customers about MobileMe issues? Perhaps the phone lines would be overwhelmed? Many of my fellow Apple consultants have chided me about relying on MobileMe, they consider the service to be an afterthought by Apple not suitable for serious work. I’ve toughed it out, my client base tends to be small businesses and home users and (for the most part) MobileMe has been a good solution despite the problems. But my patience has run out. I expect more from a paid service than casual loss of data and seeming indifference to its users. Unfortunately there is no one, or best, alternative. Options include Google Calendar and GMail; using BusySync for integrating iCal across a network (or via Google calendar); running your own calendar and address book servers using Kerio Connect or Mac OS X Server; using an Exchange server (if your company provides one); or using an Exchange/CalDAV compatible service. Get Sync’d offers hosted Kerio services that support most major devices and platforms. Apple: it’s time to take MobileMe seriously. Your customers shouldn’t have to risk their business and personal data on a “hobby” any longer. Totally agree with this article. I replaced my paper agenda with a digital one in 1996 (PalmOS and since iPhone MobileMe) and with the last MobileMe update I lost everything older than august 2010! Private appointments but more importantly, business hour registrations too! I only had the appointment files as a backup. I’m quite knowledgable in MacOS, but it took me days and days to manually add all the old events again. I eventually didn’t succeed because of errors, server problems, disappearing calendars, disappearing events, duplicates, even disappearing accounts in the iCal prefs, etc. While trying to restore my iCal CalDav MobileMe calendar, ongoing appointments can still not be added reliably, or have to be added twice. Same problems occur. No acknowledgments or updates from Apple, only advertisements for this worthless product. My agenda is a mess right now, leading to loss of control and insights in my personal and business agenda, and I’m considering alternatives. To be honest, I’m starting to dislike the Apple brand, if I also consider the performance problems of my iPhone (only 2years old). I’ve had Mobileme subscriptions twice in the past. The first time was difficult to set up, the second time much easier. I just tried to install it for a friend but had to give up after 5 hours of problems. If Mobileme was a Windows app, Microsoft would have pulled it long ago. I cannot believe Apple push such a bug ridden app! I’ve had the sync problems. When you have multiple gigabyte files, it’s not fun. I joined the calendar upgrade at beta stage however, and though I had to configure it to run on my iPad, it’s was fine for me. But I didn’t need data older than 6 weeks, so I wouldn’t have noticed old calendar data being deleted. iDisk sync problems though I’ve had multiple times now. There are some fundamental problems with keychain credentials which I suspect started when I set up my new iMac by restoring a time-machine backup of my MacBook Pro. The MobileMe service didn’t seem to like the two devices syncing with iDisk. I resolved the problems by switching off iDisk, logging out of Mobile Me (on both machines) logging back in and setting the machine up with a new device account (I think that’s what it is called) and switching the iDisk back on. Be warned, stopping iDisk causes the iDisk drive (under the cloud icon on your desktop) to be unmounted and archived as a sparse-bundle folder on your desktop. When you restart iDisk it will be empty and will need to sync all the files back from the cloud. You can switch off automatic syncing and copy files from the folders within the sparse bundle, but if you do this after having had sync problems, be careful to ensure you aren’t copying over the files you want, with older versions you don’t). Since I took this measure it’s been fine. However I agree these edge cases are far too easily encountered by the user. Apple needs to do a good amount of tidying up. This is one of those services where a small technical problem can cause massive and disproportionate user pain and disruption. Apple need to understand that and employ their famous quality first ethic more stringently for cloud services than desktop and mobile apps, not, as is currently the case, less. The SMTP timeouts did it for me. After a few “chats” and e-mails from their support people telling me it was my ISP, Router, Computer, Taste in Music, Clothes, Sunspots, or just about everything other than them, I gave up and went to Gmail. Their support for MobileMe is horrible, and you pay $99/yr for this service. I’ve been using Gmail for the past two years and have had no problems sending or receiving mail with it–it just works, and it’s free. Gmail….free e-mail, sync, push, and best of all–no SMTP timeouts!!! I recently went over my .mac/MobileMe email-only account storage limit (a sad 512MB). I was not notified that I was even close to my limit, so for 9 days, that account was bouncing back emails and I had no idea. I didn’t notice that I wasn’t receiving email on that account because I maintain multiple email accounts that are all funneled into one big inbox for Mail and iPhone. This was a serious flaw in the system, and after 8+ years of using .mac/MobileMe, I am considering giving up on the system. Since the inherently flawed inception of MobileMe, I have only utilized the Mail and Contacts functions, therefore, I have only renewed to preserve the email accounts that I have used for almost an entire decade. I was very young when I first signed up for the service, and my primary account name is quite juvenile. My professional email is an email only account, and the primary (juvenile) name is no longer used. Since the unused name has 2GB of storage and the heavily used professional email has only 512MB, I asked them to switch the heavily used to the primary and they said it was not possible. The only reason I didn’t just create a new account is because I don’t want to be forced to use the new @me.com domain. At least with my old account, I can continue using the @mac.com. I think we should compile a list of consumer grievances and submit them to The Consumerist blog to pressure Apple to DO SOMETHING. Who’s with me?! It’s a great idea poorly executed. It’s also slow, really slow. I moved over from using yousendit.com for the other features and was struck at how poorly it made use of my pretty speedy broadband connection. Also I can’t add anything to my iDisk through it at work using the Finder, though Cyberduck on the same machine will do it just fine. A glitch, a small number affected perhaps, but as we’re all in a mixed PC/Mac world making this work shouldn’t be beyond them. I would also suggest that if they brought the price down, made it more integrated with new users out of the box and only started charging after the first 6 mths or year it would gain more traction. at its current price after a short time most users will let it slide and stick with google or similar. 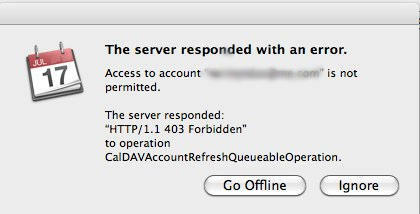 Add me to the list of people who find Mobileme unreliable. What happens with my account is that it will simply stop syncing my iDisk with my Mobileme account, for no reason I can find. I restore the syncing and then I’ll notice a month or two later that it has stopped, once again, syncing. I have no idea why this happens but it should not be a recurring problem. Otherwise, I think it’s an OK service. It should have more space for the price we pay.